With decades of experience in their respective fields, our team of 30 technicians are dedicated to ensuring that each customer is set up for success. The audit process helps our technicians understand your goals and observe current processes to find opportunities for improvement and cost savings. Our techs help streamline equipment and materials to improve the end result and ensure that the product gets where it’s going without damage. Our technicians consult with you to help improve productivity, reduce downtime, and ultimately reduce costs for the product packaging. The level of technical service we offer at Atlantic is unsurpassed among our competitors. 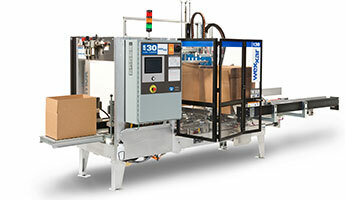 Our strategy of investing in expertise and assembling a group of technicians who are experts in their fields of stretch wrapping, shrink packaging, integration, and general packaging equipment helps our customers achieve their goals of improving productivity and uptime while reducing waste and preventing product damage. Our technical service team works closely with our sales team to deliver the results that are promised. We go the extra mile when it comes to servicing equipment, matching films, testing and monitoring performance, and providing the training and education necessary to ensure long-term success. Thanks to the experience and talents of our equipment specialists, Atlantic was named the Top Wulftec Distributor for 2017. Wulftec is a world leader in stretch wrapping equipment used in a wide variety of industries. Atlantic roll wrap technicians bring decades of experience working at all angles of this packaging process. Our collective experience provides us with a comprehensive understanding of our customer’s needs and all the factors throughout the process that can affect the performance and outcome of the final product. The bottom line is that we offer high performance film wrap for optimal protection of your product through all stages of handling, delivery, and storage. We work with large-scale paper mills and are adept at handling roll wrap systems and materials to protect rolls up to 6′ in diameter and up to 5,000 lbs. We supply film that is optimized for specific applications and we propose systems that will be most effective to the customer’s desired outcome. To this end, we offer radial wrap, axial wrap or a radial axial package that will fully enclose the roll in protective film to help it withstand handling on the forklifts, exposure to weather, non-optimal conditions, and storage with other product. Where Atlantic’s added value lies with our customers is in the creative solutions we can offer to help solve problems that may be causing damaged freight or throughput problems. Our knowledge of the equipment, the systems, and the materials together with our sensitivity regarding our customers’ unique needs and budget concerns make Atlantic an invaluable partner when it comes to roll wrap. One of the elements that makes our technicians such an important asset to our customers is the time they take to observe and audit existing conditions with the packaging line, equipment, materials, and machine operators. The audit process is key to having our sales and technical team understand our customers’ goals in terms of resolving any issues they are experiencing, helping them achieve better performance, and reducing costs. Auditing also allows our technicians to find opportunities for improvement and optimization, whether that’s with the equipment, the materials, the application, or some combination of each of those. The troubleshooting process starts here as the technicians learn more about the product, how it’s being packaged and shipped, and the particular packaging application of film, strapping, bagging, or taping. Our goals are always to find process improvements that promote efficiency, reduce waste, and save money. Once our sales and technical team complete an audit of existing equipment, materials, and application, they get to work finding ways to optimize the process. That can mean making adjustments to existing equipment or recommending new equipment, finding better films to fit the application, finding ways to make a package using less film and materials, improving throughput, and training operators and maintenance personnel on proper setup of the machines. Ultimately, our goals are for your packaging line to run smoothly without downtime and for you to have educated, knowledgeable machine operators and maintenance crew. Atlantic technicians provide extensive training so that the operators and maintenance crew understand how the equipment works, what makes it work, and how to either troubleshoot problems themselves, or how to best communicate any issues so our technicians can help solve them quickly and efficiently. Empowering our customers with knowledge and technical skills on packaging equipment is a critical part of our optimization process. Process improvement means reaching the goals of improved productivity, reduced waste, and cost savings. The most important step we take in achieving this is in earning the trust and confidence of our customers. We are dedicated to explaining our process so you understand why we make the recommendations we make. We provide demonstrations to illustrate concepts, we test materials and applications to back up our theories with data, and we ultimately provide measurable results. Our technicians are experts in specific fields of packaging, such as shrink packaging and stretch wrapping, and we also have excellent general technicians who can work on all types of packaging equipment. Our techs work together and support each other to solve problems, troubleshoot issues, and create improvements. When you come to trust our sales, technical, and support teams, we create a remarkable partnership that thrives on reliability and results.